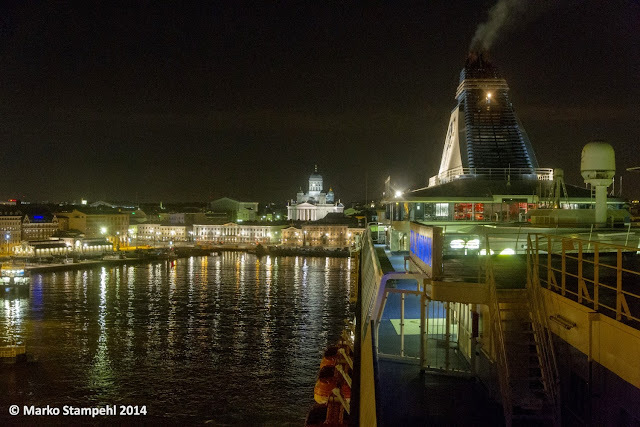 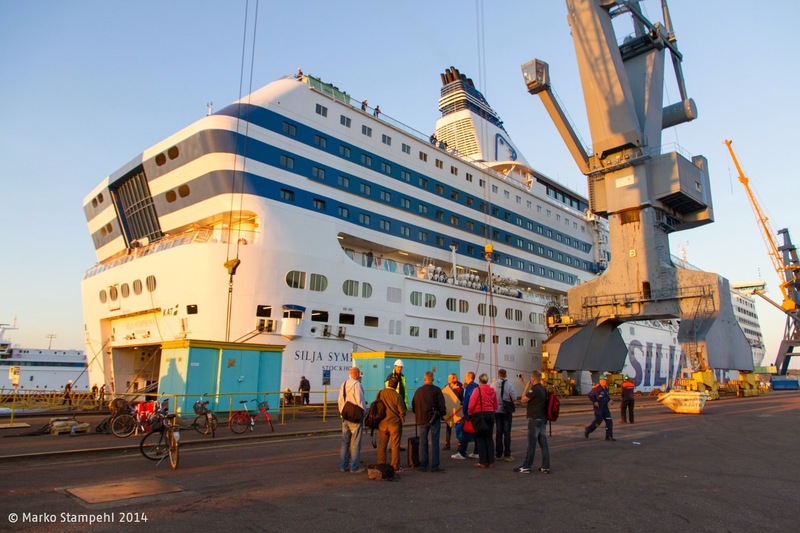 SILJA SYMPHONY arriving at Helsinki in the morning of 6 September 2014 from her last sailing with passengers prior the docking. One hour after berthing first "demolition teams" had already carrried away e.g. 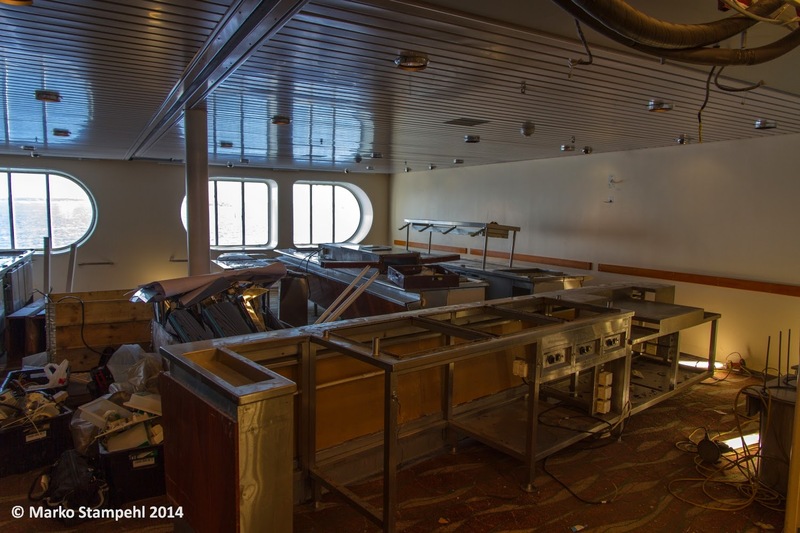 the complete furniture (tables and seats) from the Buffet Restaurant. 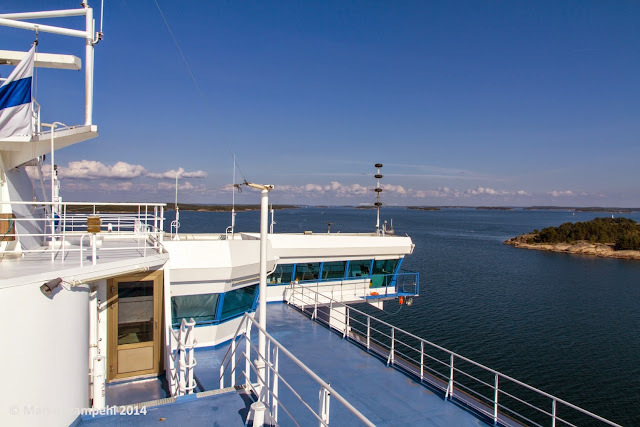 Having travelled numerous times (so far) to my northern "other" home country Finland has included a lot of trips on the ferries between Sweden and Finland. 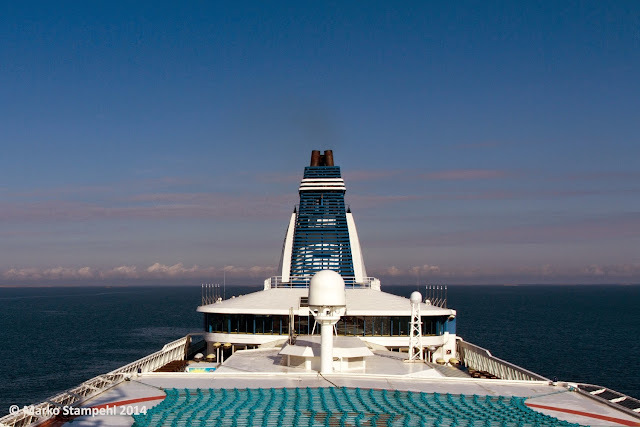 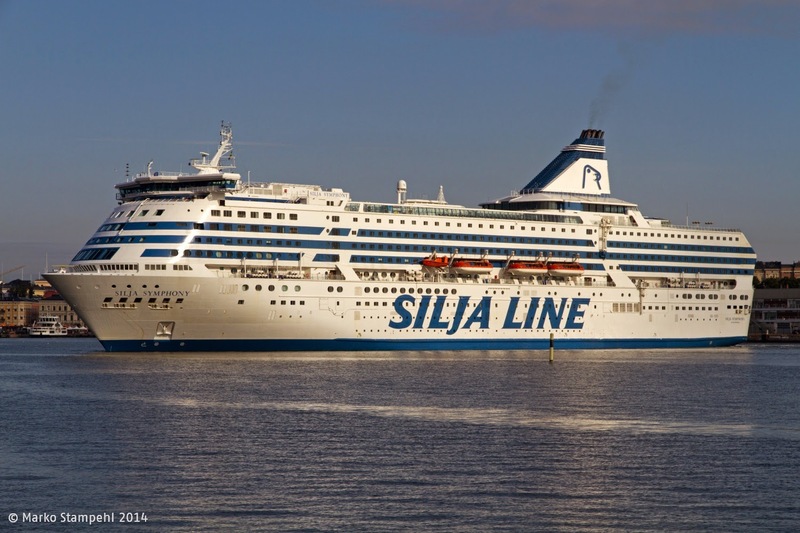 While I am by far not a "heavy traveller" on these ships, it must still be well over 100 single trips on them, specially on the two sisters of Silja Line, the 1990 built SILJA SERENADE and her sister SILJA SYMPHONY (built 1991). 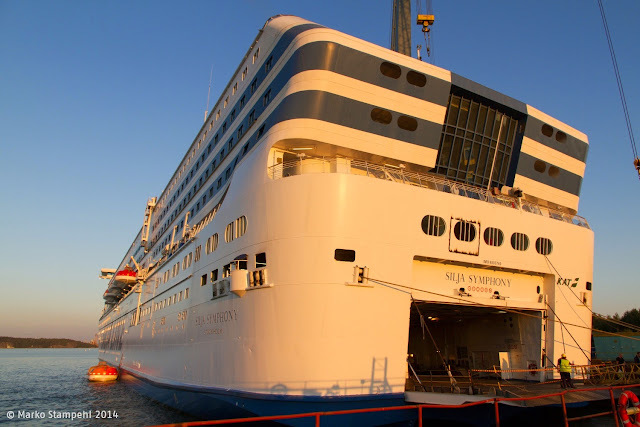 My trips have included real "ice breaking" voyages (on SILJA EUROPA in March 2010 - including a heavily delayed return trip to Stockholm via Sandhamn) and I also have been "stormbound" on the SILJA SERENADE in December 2011, when we arrived heavily delayed as heavy side winds prevented a safe entry to the South Harbour of Helsinki through the Kustaanmiekka passage. 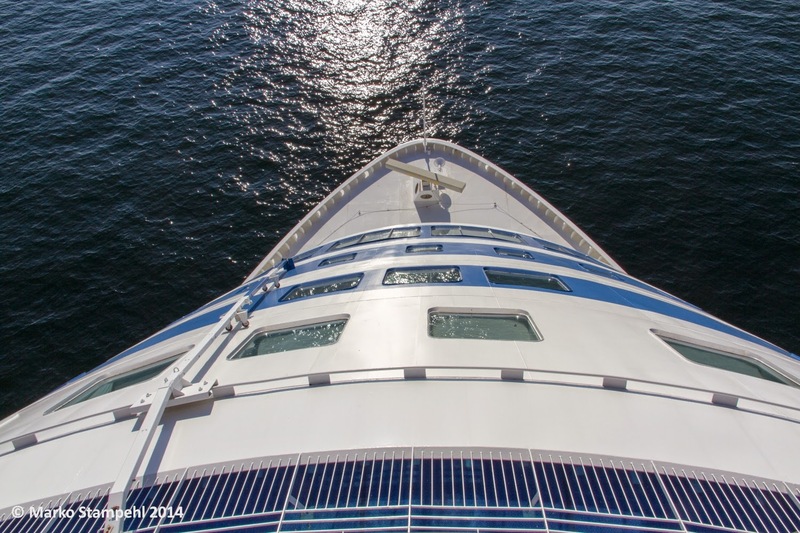 Just to name a few special trips I have been enjoying. 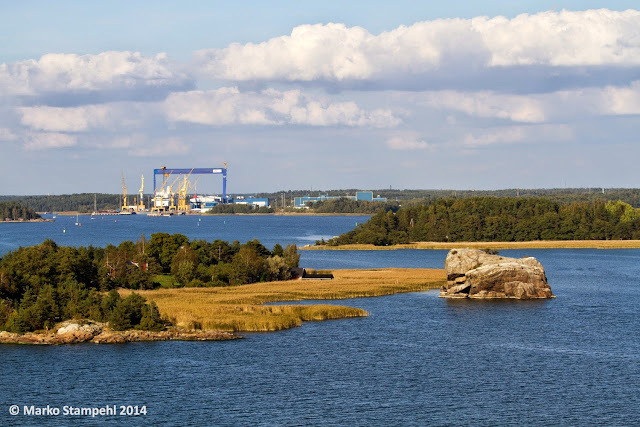 But never had I been on a trip to the shipyard though, so when I received the invitation to join the SILJA SYMPHONY for her trip to Turku Repair Yard in Naantali in September 2014, I was hooked. 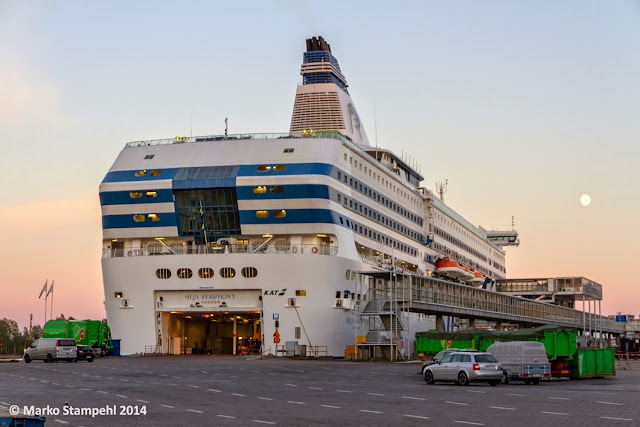 Boarding was arranged through the cargo gate of the Olympiaterminal and via the ramp of the car deck as the passenger terminal was already closed for the day. Departure from Helsinki was scheduled for Midnight, so the group which consisted of some Finnish journalists from both maritime publications as well as travel and daily press, bloggers and others met at eight p.m. at the terminal entrance. 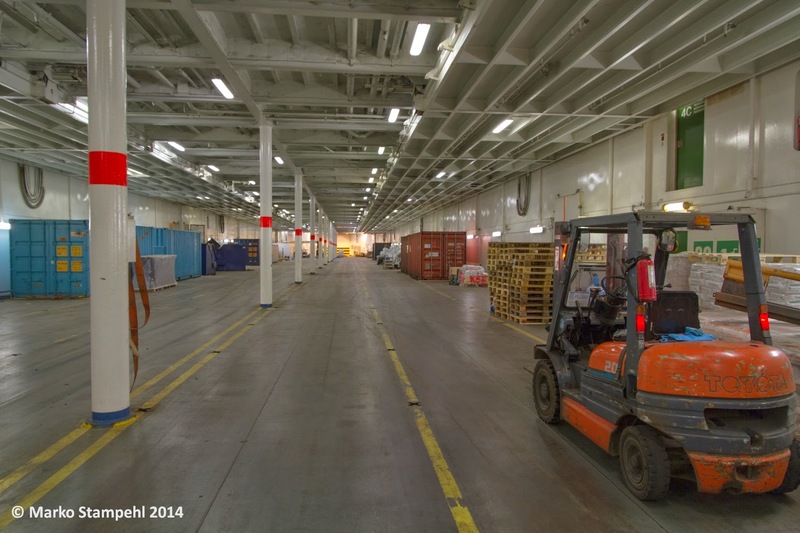 We then walked over to the cargo gate to get inside the ISPS area, and down the cargo/truck marshalling area. At the ramp we were met by the vessels intendant who went with us through a rather unorthodox check-in procedure. 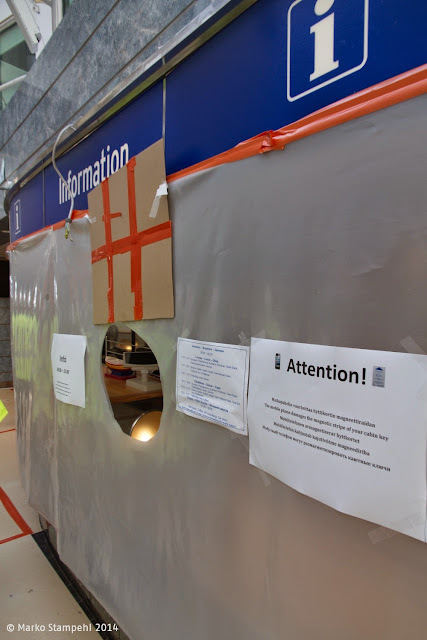 Contrary to the normal routine when checking-in for a trip, this time the procedure was simple. 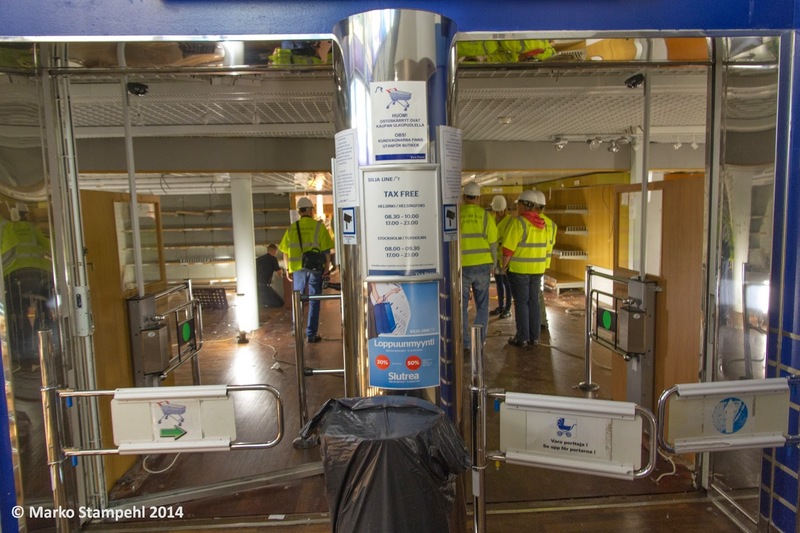 Everyone was called by his name and was handed over a boarding card with keycard for his cabin. 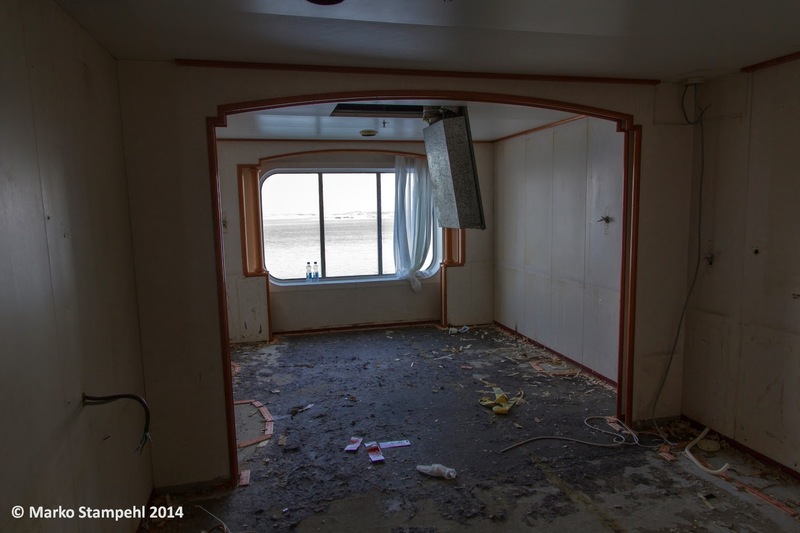 We were all accommodated in Deluxe seaside cabins, which had the advantage of being furthest away from the biggest construction sites on board. View from the bridge wing at midnight: departure from Helsinki. 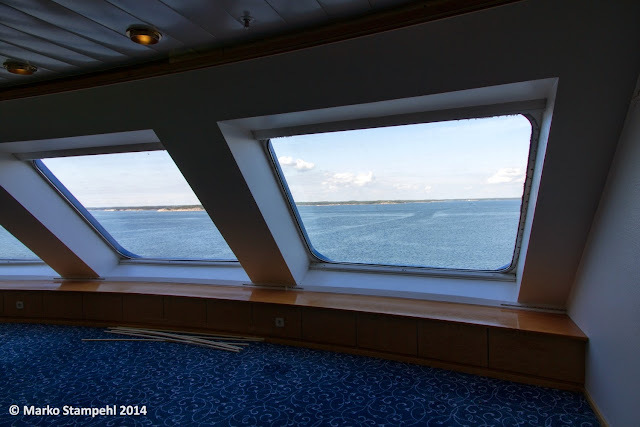 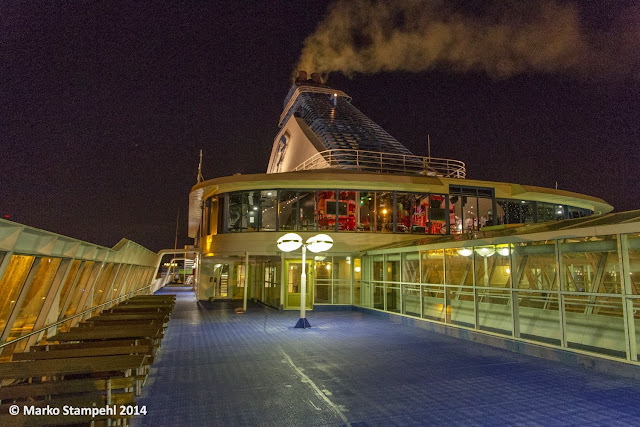 Quiet athmosphere on the upper sundeck (Deck 12) upon departure from Helsinki. 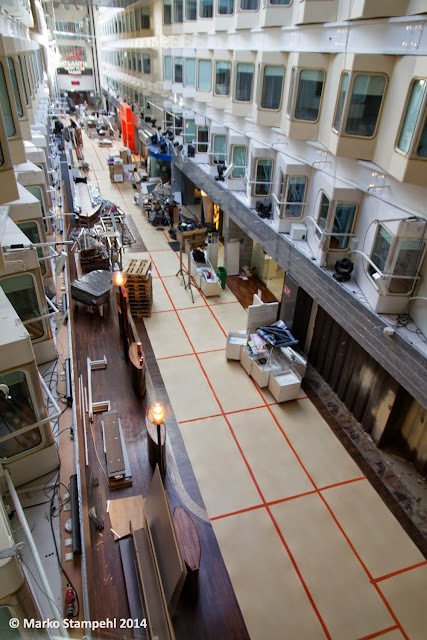 as the ship served as the accommodation for several hundreds of workers. 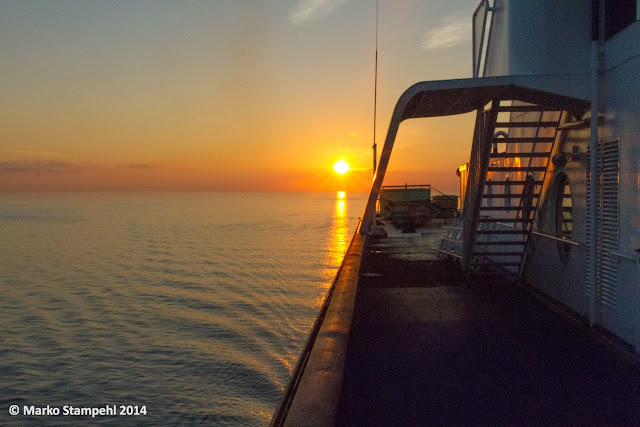 Wonderful sunrise in the morning of 7 September 2014, Position SE of Utö. 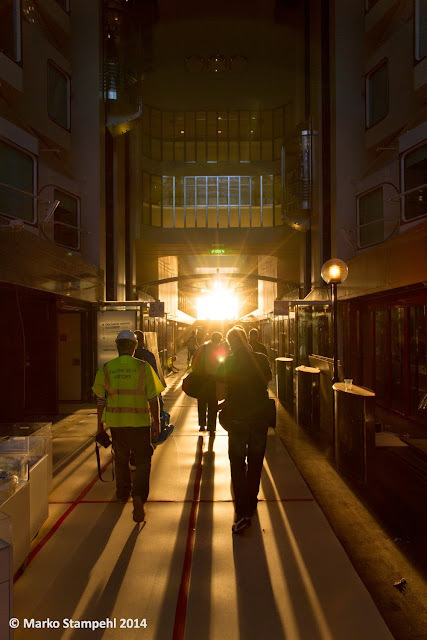 About 7 o'clock in the morning. 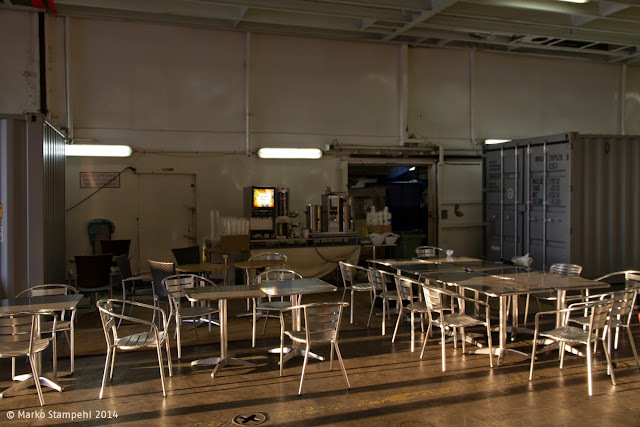 Breakfast in the morning was served in the temporary "construction site" mess, which had been set up in the conference center. 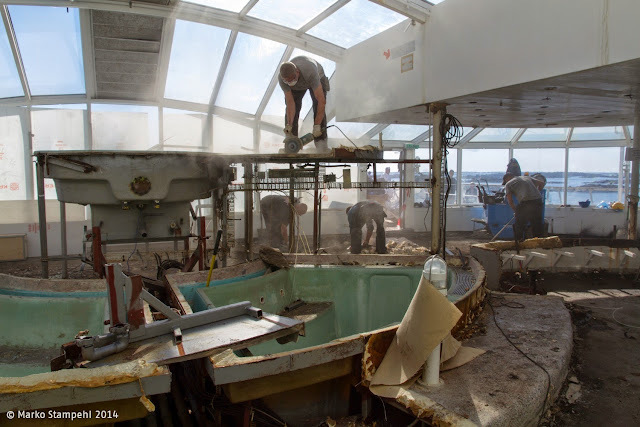 All crew and workers had the strict instruction to wash and disinfect their hands, in order to avoid any diseases to be spread. 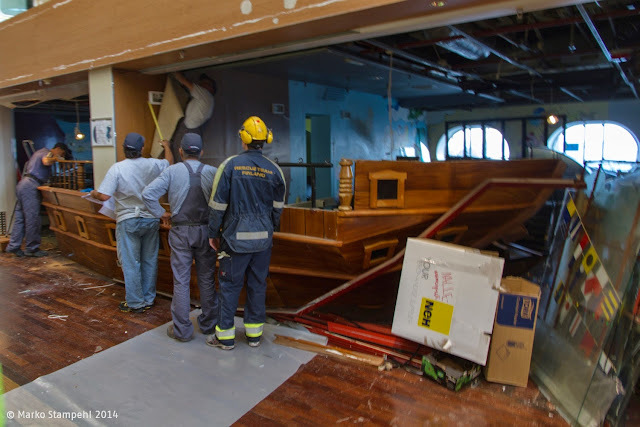 Temporary washbasins in the hallway outside the conference center on Deck 6 fwd. 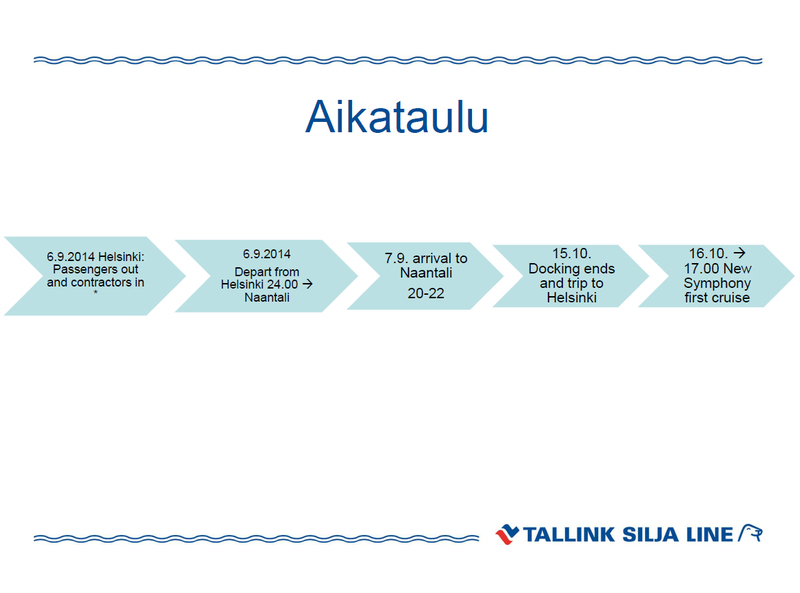 After the breakfast, we received a presentation giving us more detailed information about what was going to be rebuilt and done during the almost six weeks long docking in Naantali. 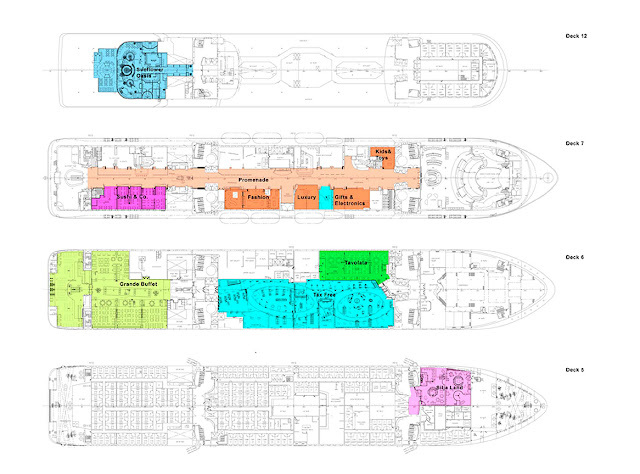 This Deck Plan shows the areas which were being rebuilt in September/October 2014. 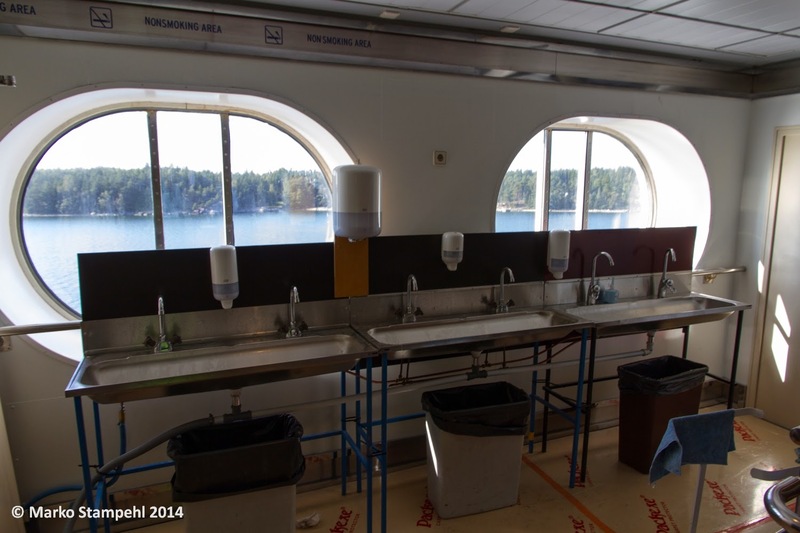 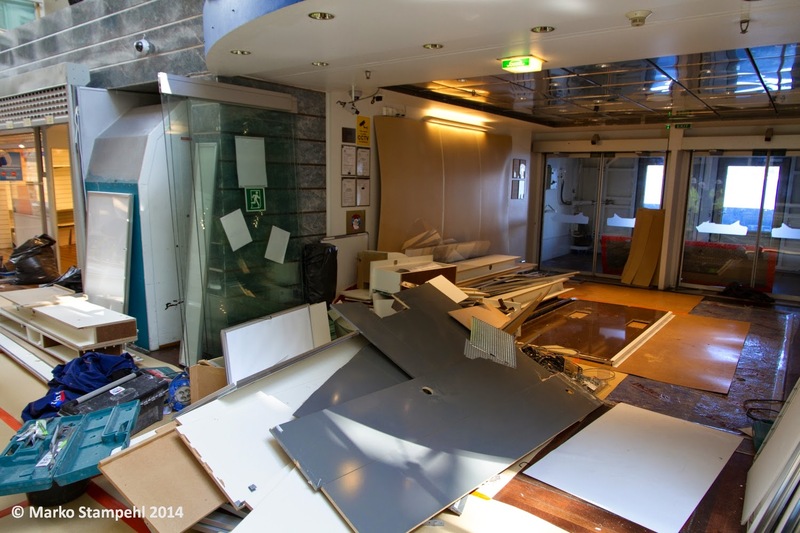 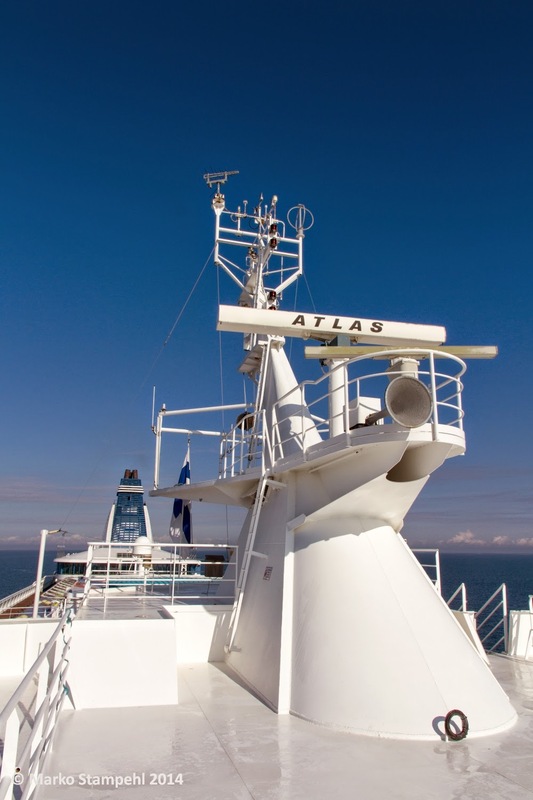 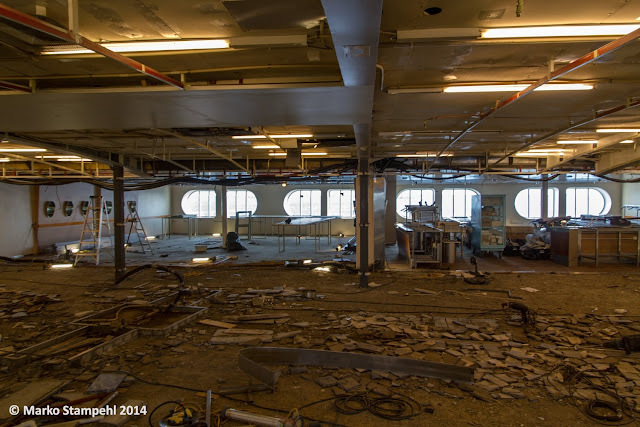 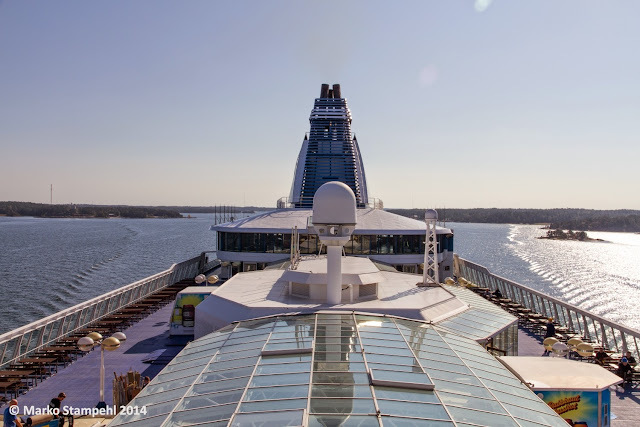 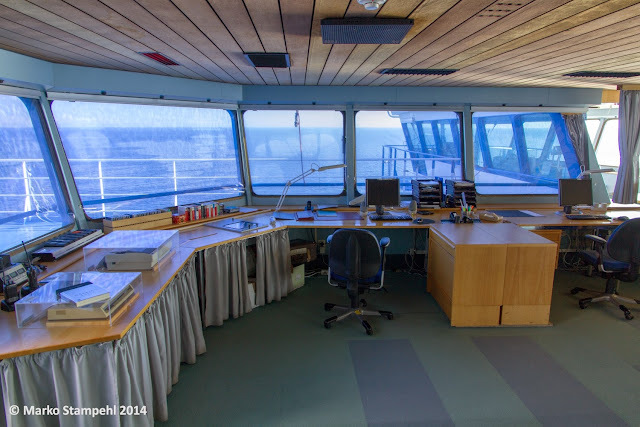 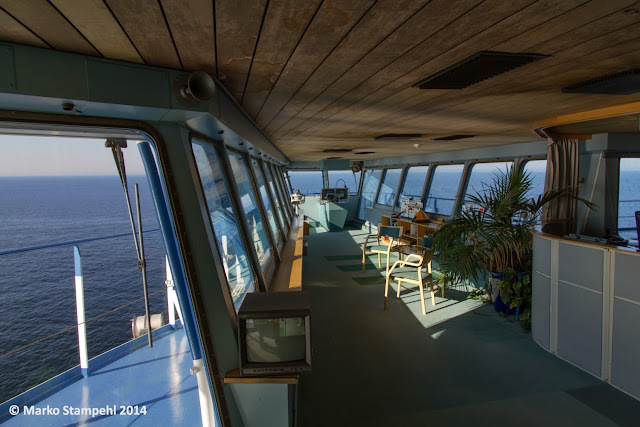 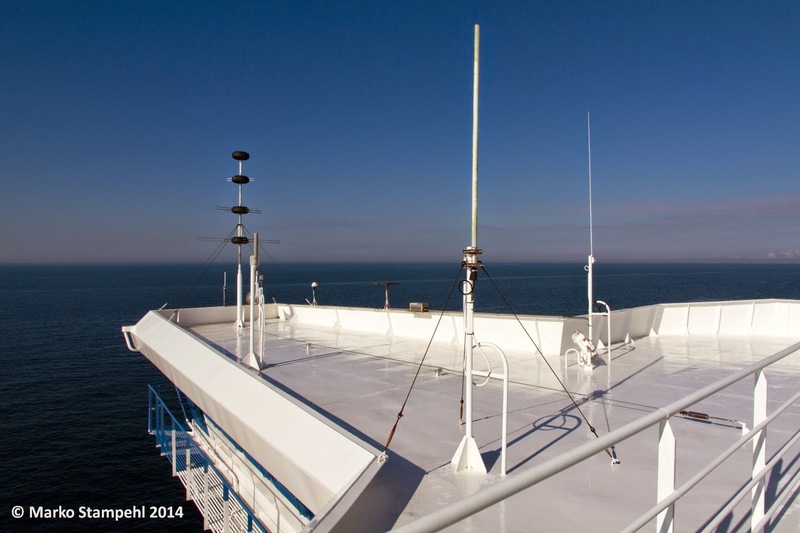 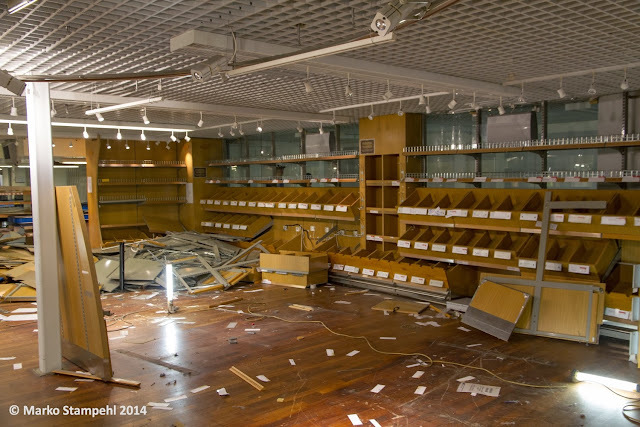 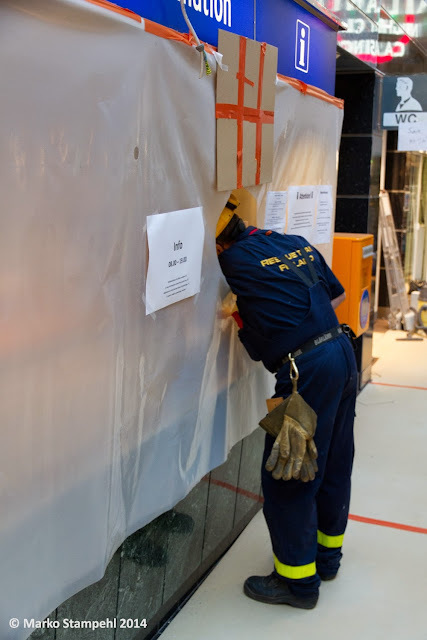 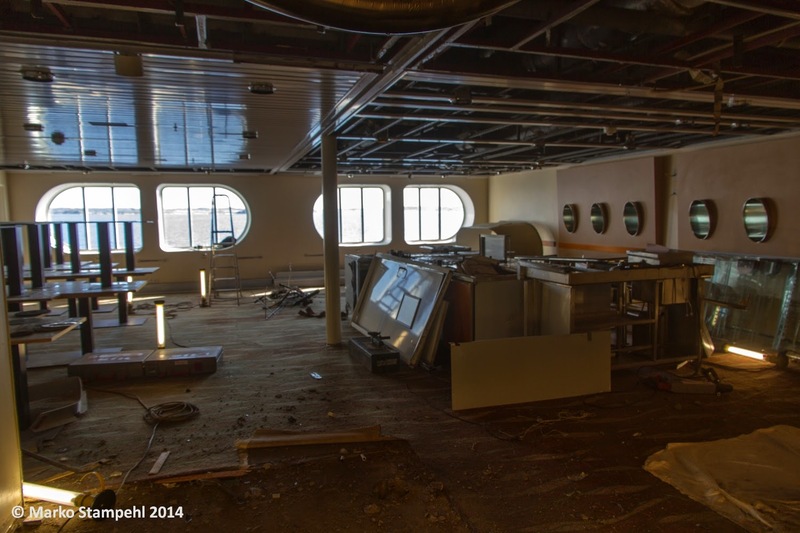 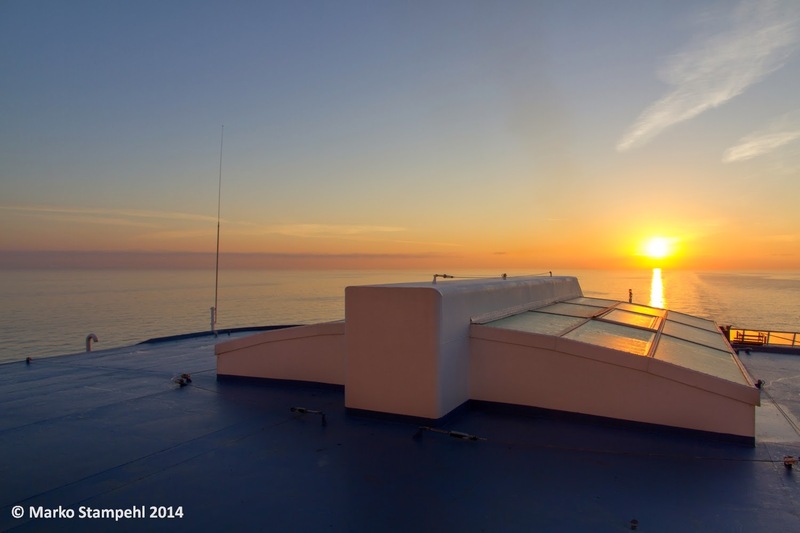 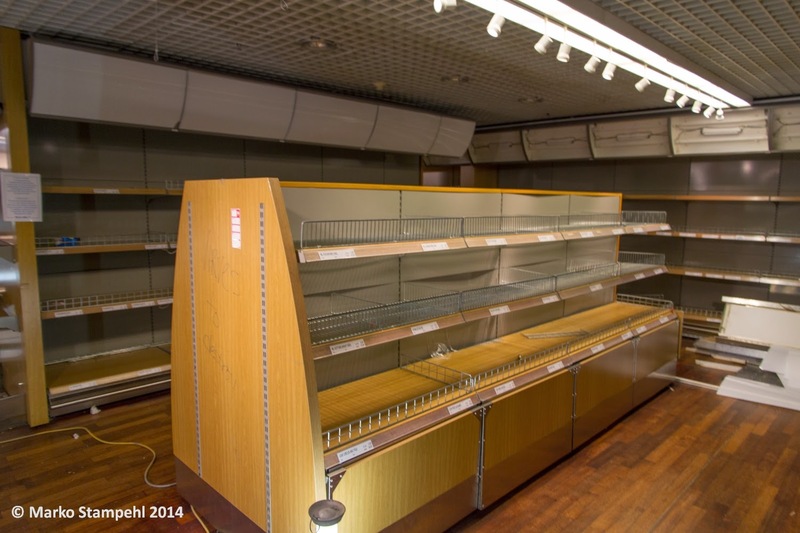 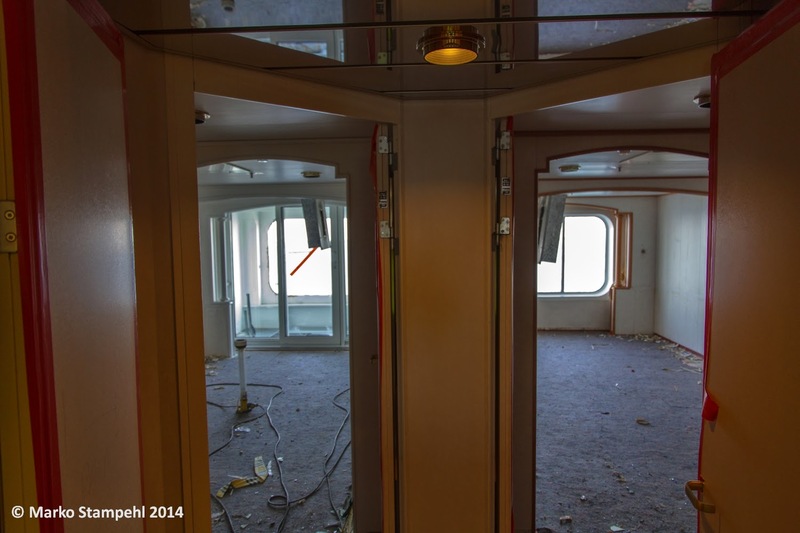 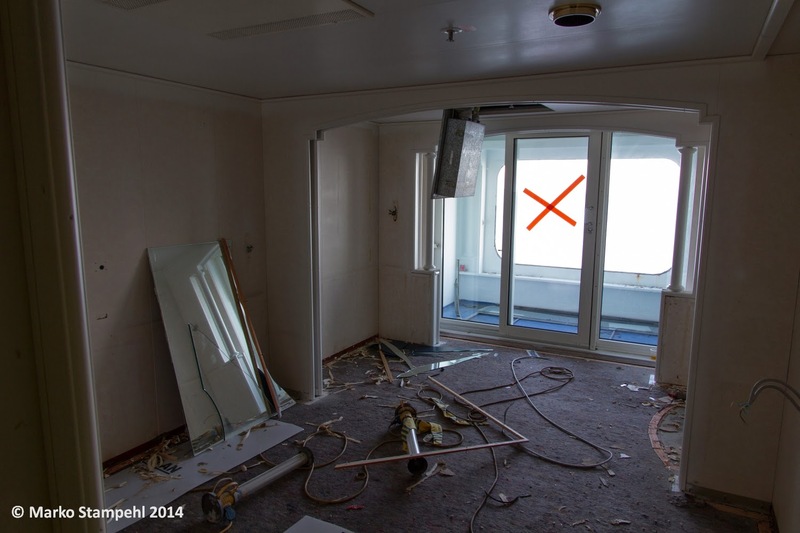 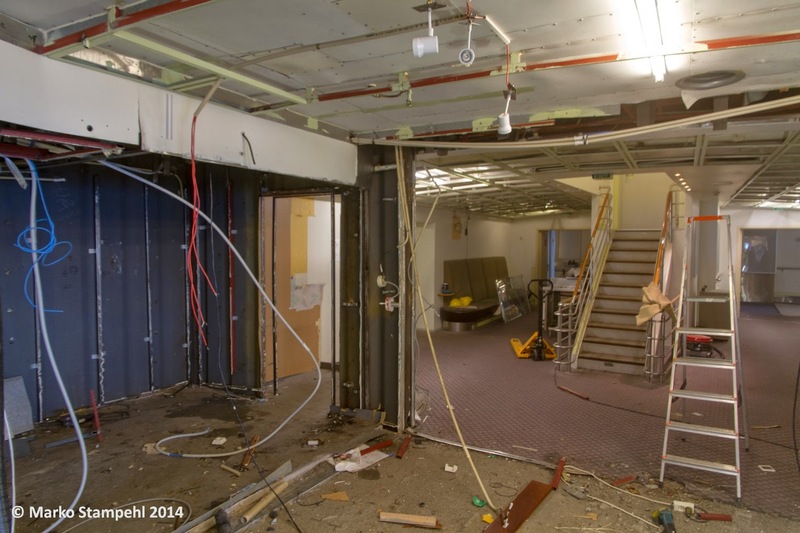 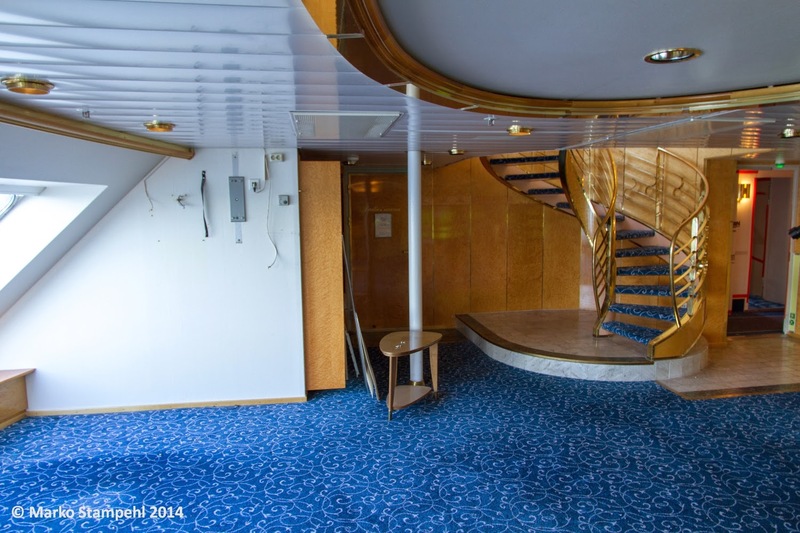 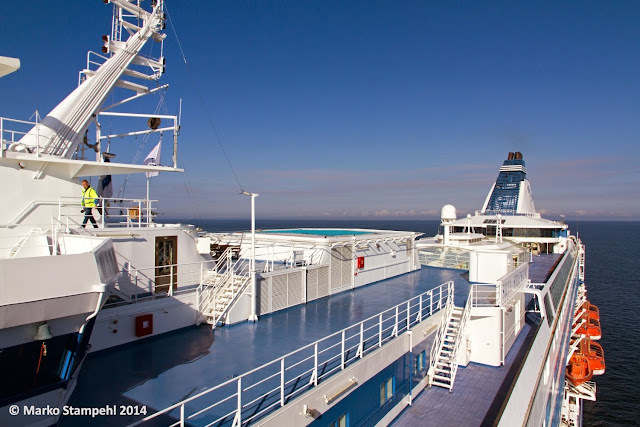 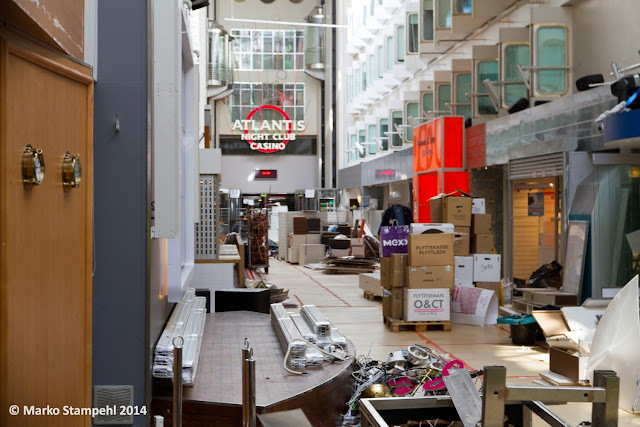 The sister vessel SILJA SERENADE had undergone a similar refurb during January/February 2014. 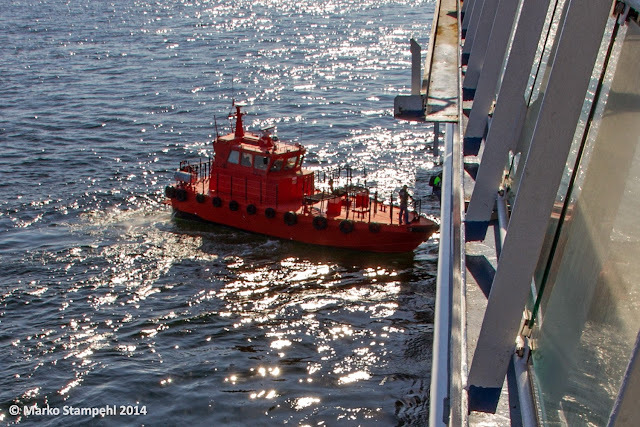 After the presentation it was time to pay the Captain an official visit by the group. 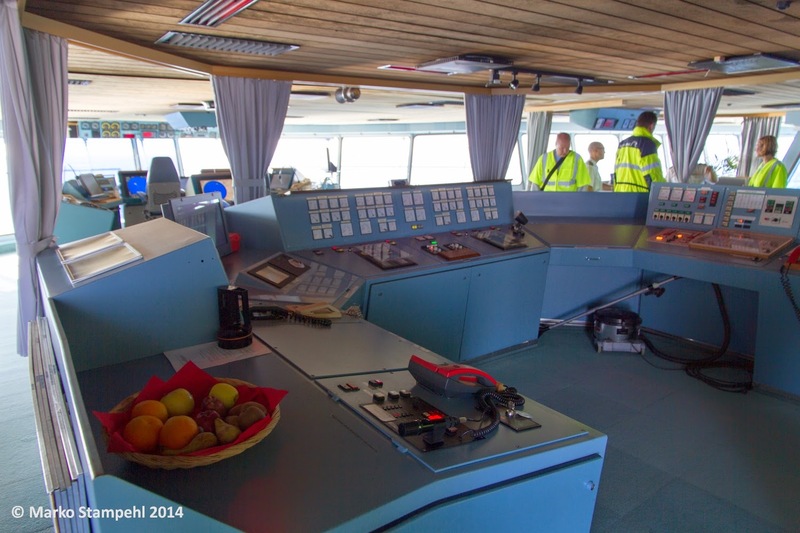 This was to become the most extensive and in-depth introduction to a ferry's bridge I have ever been to. 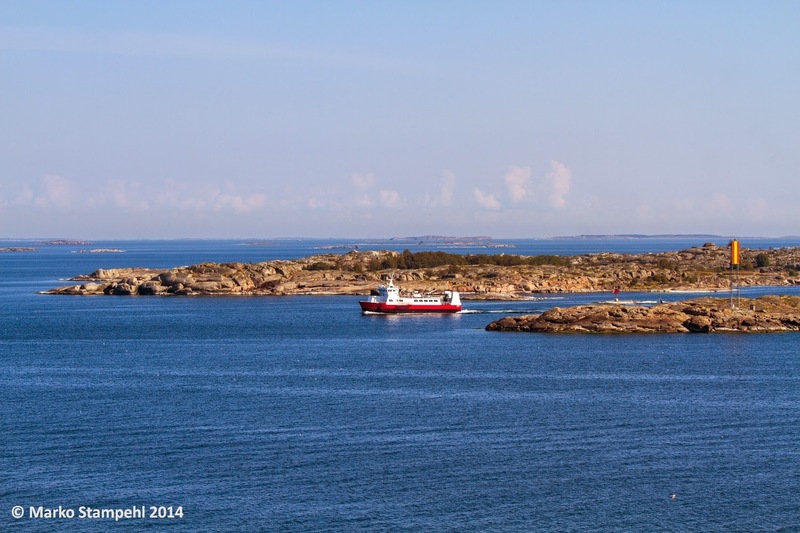 The visit took place while the vessel was at anchor off the island of Utö. This was the first time in many years that SILJA SYMPHONY had actually used her anchors. 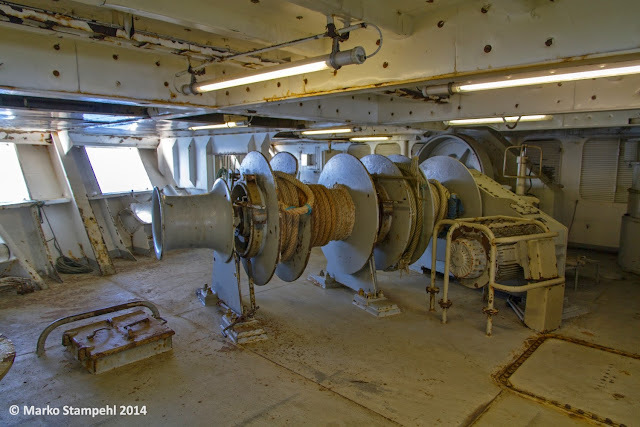 View down from 'monkey island' on the forward superstructure. 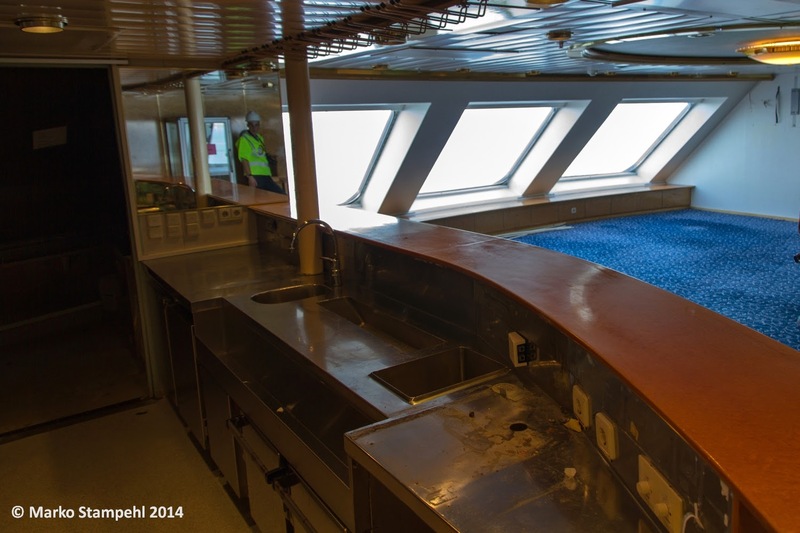 View aft from the top of the portside bridge wing. 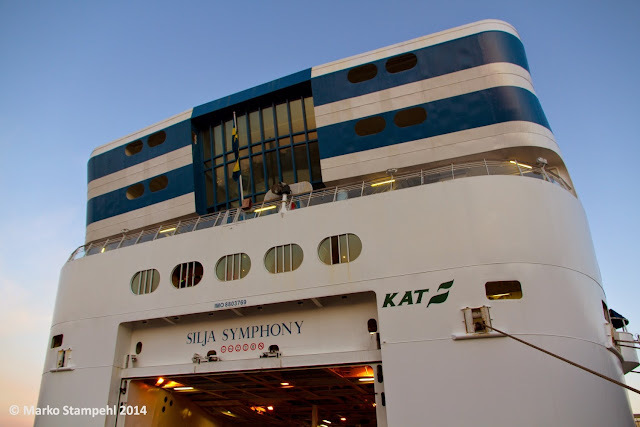 The funnel of SILJA SYMPHONY seen from the helipad. The radar mast with radar and other antennas and one of the horns. Walking around on monkey island and the mooring station was a special experience indeed. 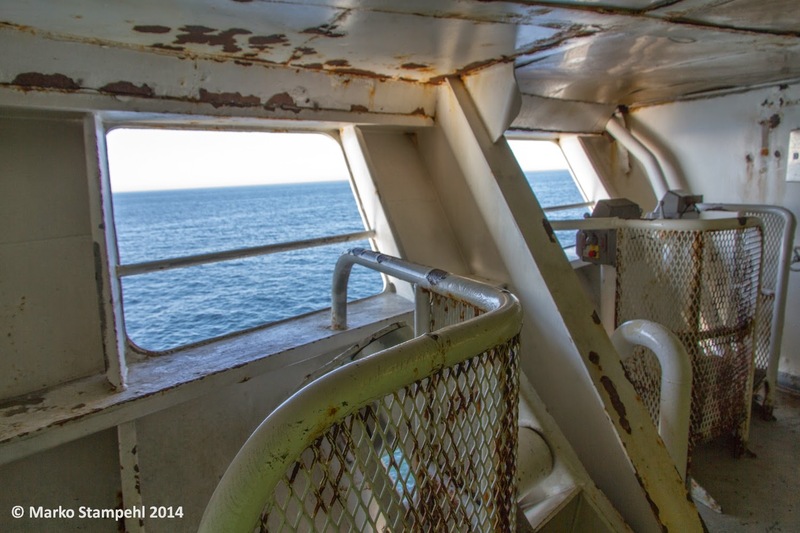 These areas are strictly off limits for any passengers and we got there with a special permit from the ship. Taking the Pilot for the Turku Archipelago off Utö. 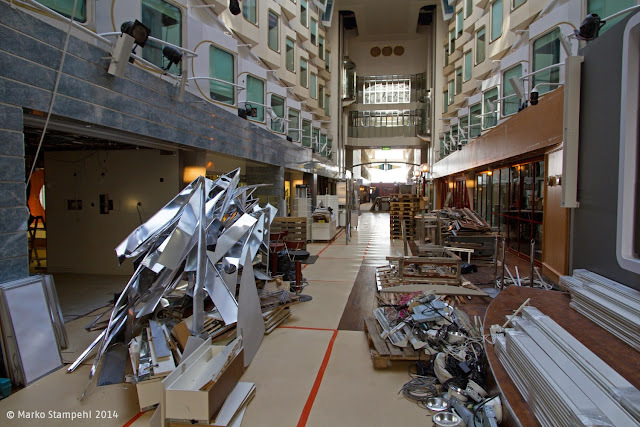 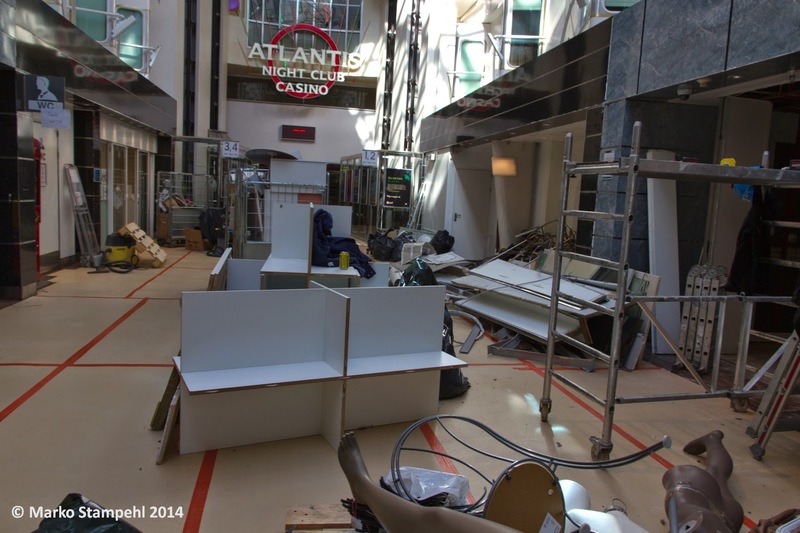 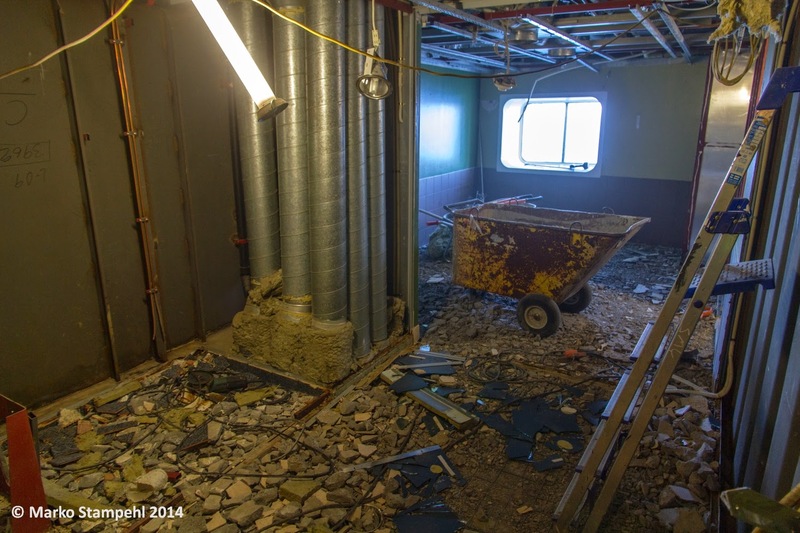 We then continued our "tour de construction sites" through the ship to see the status in which the different areas were at. Bellamare giving way for the new children's playroom "Siljaland". 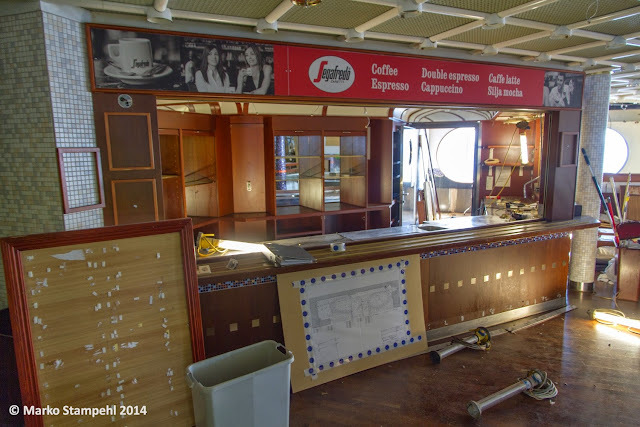 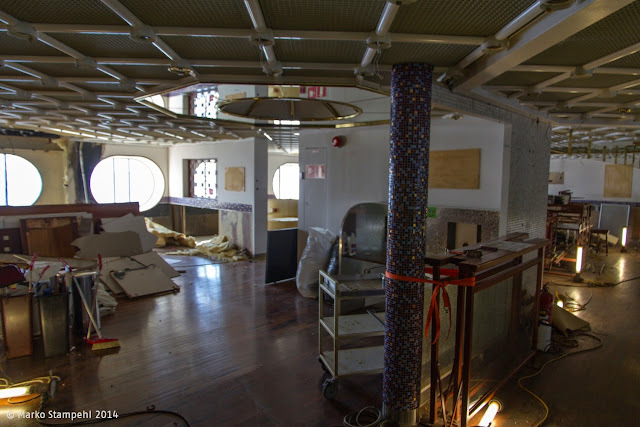 The bar of the Orient Café in a "half-dismantled" state. 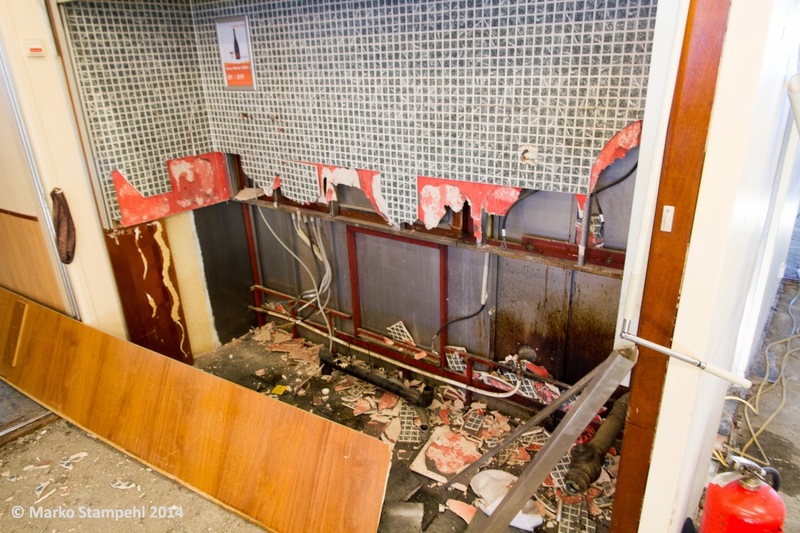 Reception counter of what was once Bistro Maxime. 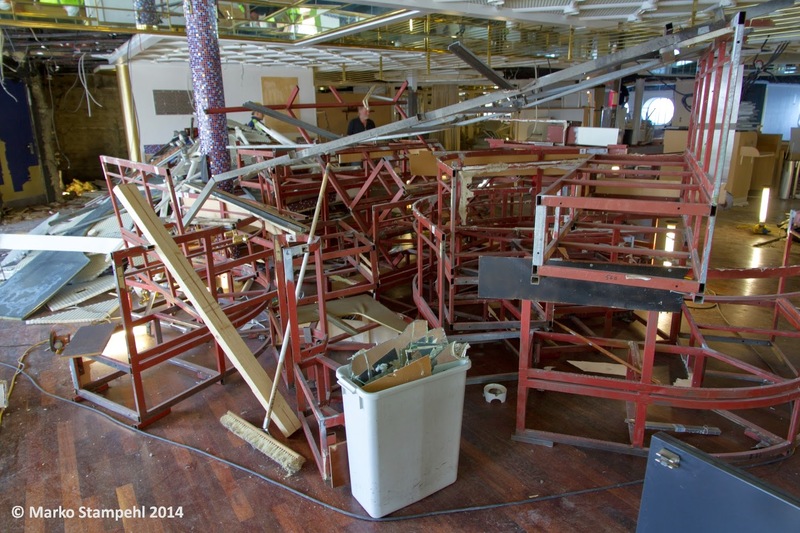 Scrap from Bistro Maxime and Orient Café. 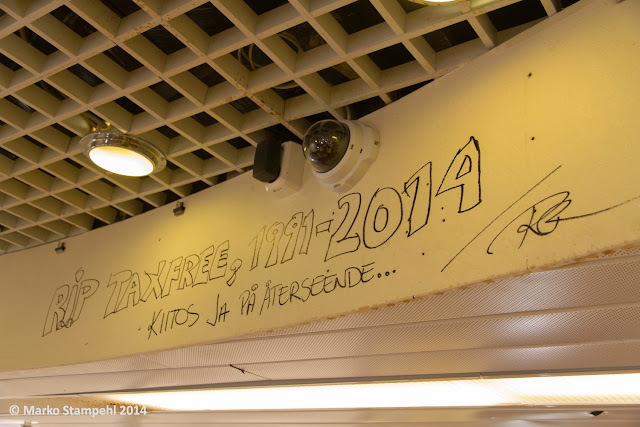 Entrance to the Tax Free Shop. A "last greeting" from someone from the shop crew. 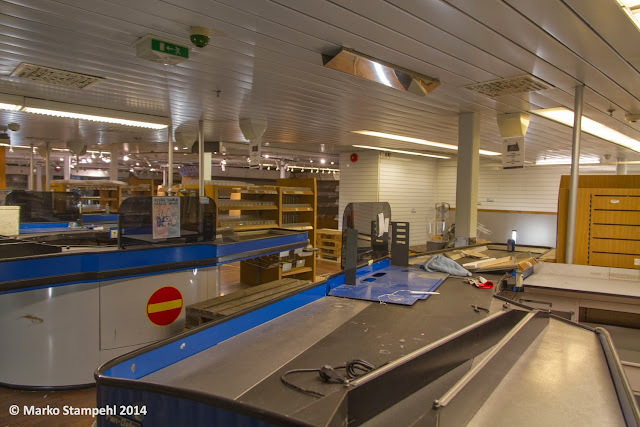 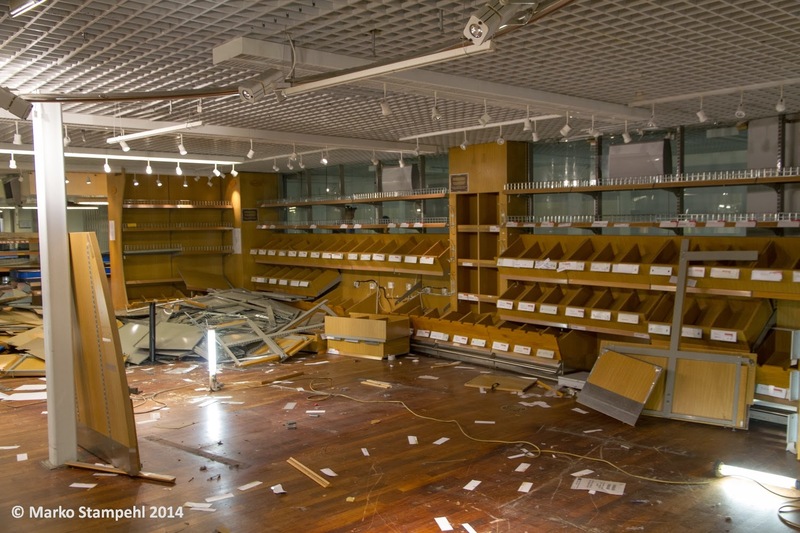 Former cash desks, ready to be moved out. Half dismantled Buffet Symphony- the buffet counter has disappeared. Half dismantled Buffet Symphony- former beverage station. 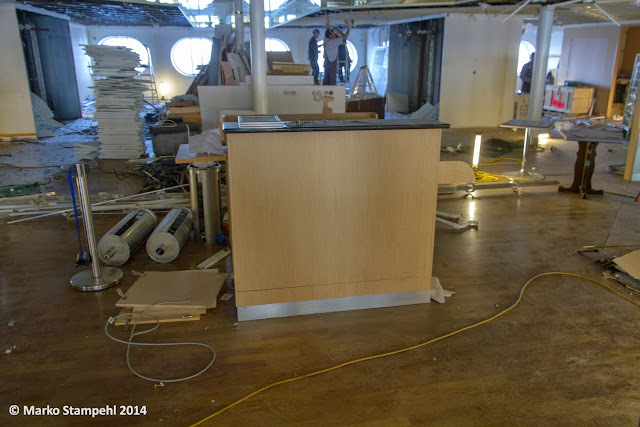 Half dismantled Buffet Symphony- extension aft. 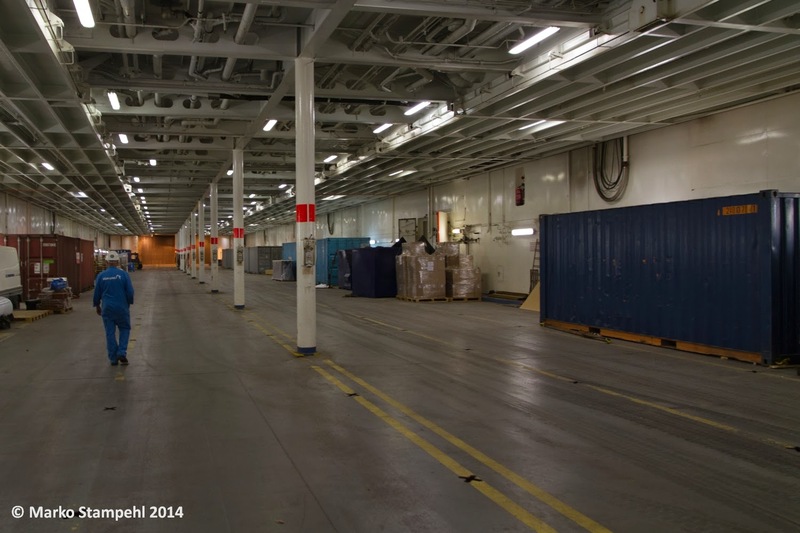 Deck 3 - Car Deck - serving as storage area, featuring a cafeteria. 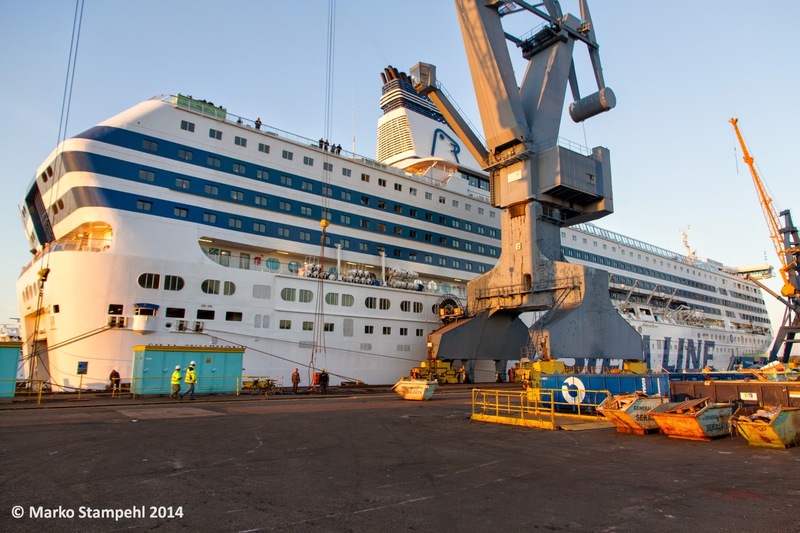 Meyer Turku with MEIN SCHIFF 4 under construction. 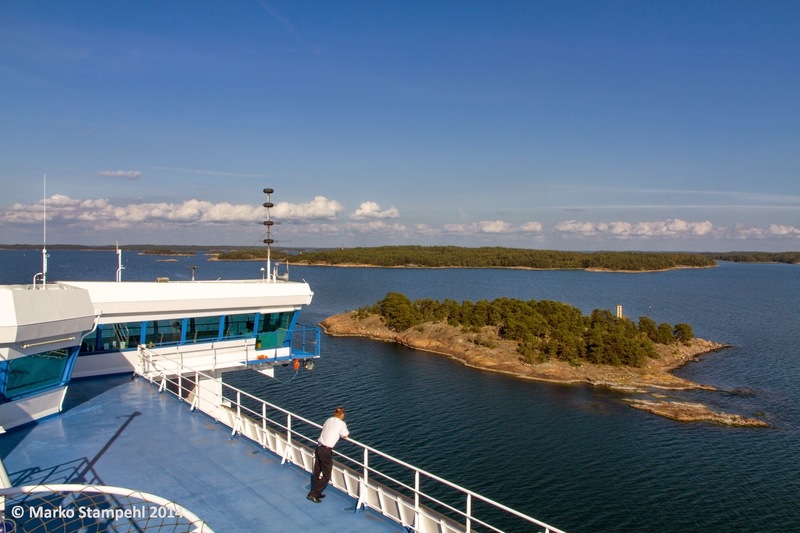 Shortly before the arrival to Naantali we were about to enjoy a very special meeting. 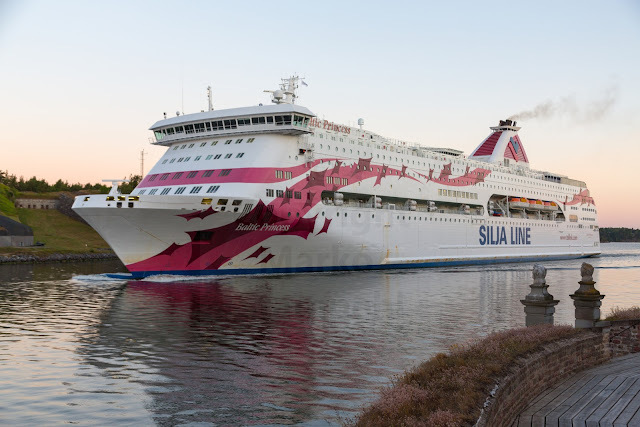 SILJA EUROPA which had been chartered to Bridgemans for a year as accommodation vessel for the Gorgon Project on Barrow Islans (NW Australia), had been docked at Naantali and was about to depart to Tallinn for a final stop before commencing her trip to Australia. 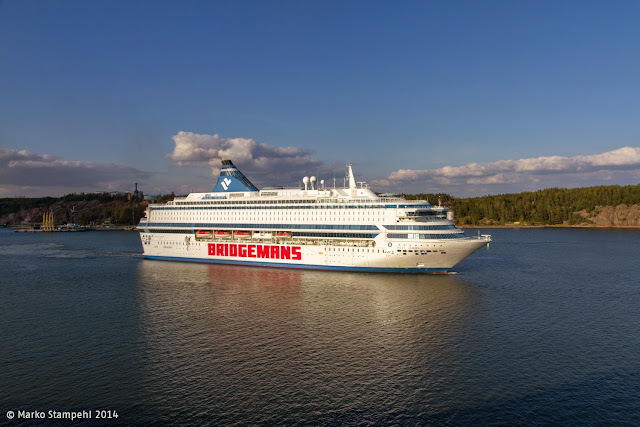 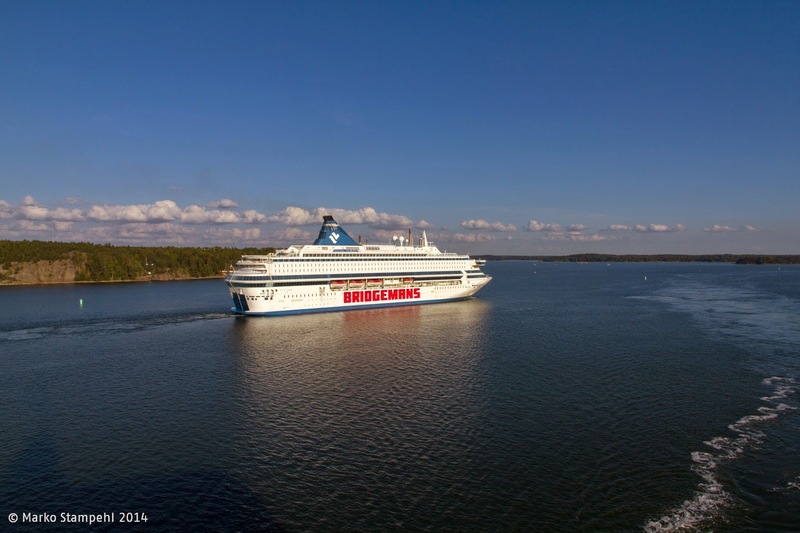 SILJA EUROPA with the Bridgemans logo on her hull, having just departed from Turku Repair Yard in Naantali. SILJA EUROPA heading to Tallinn. Note the shadow of the superstructure and funnel of SILJA SYMPHONY left. SILJA EUROPA behind the scrap containers on the sundeck of SILJA SYMPHONY. 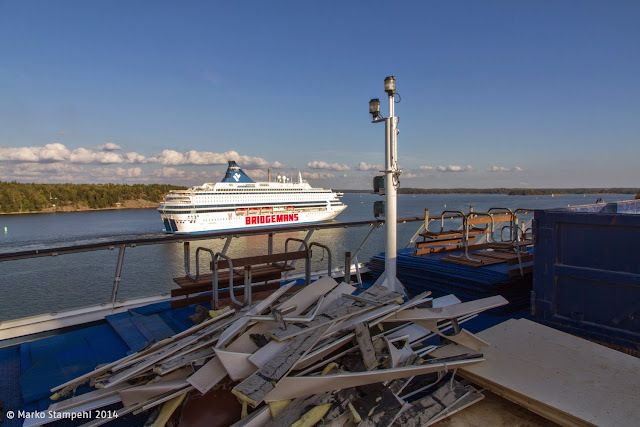 After meeting the SILJA EUROPA which was on her way to Tallinn and further to Australia, we turned in front of the shipyard and arrived at Naantali. 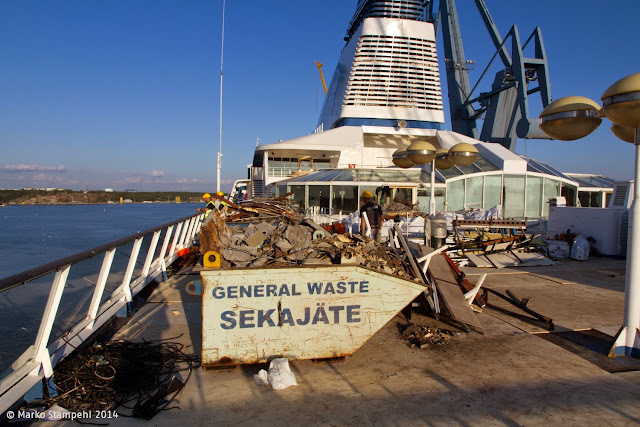 Scrap and waste containers on the sundeck aft. 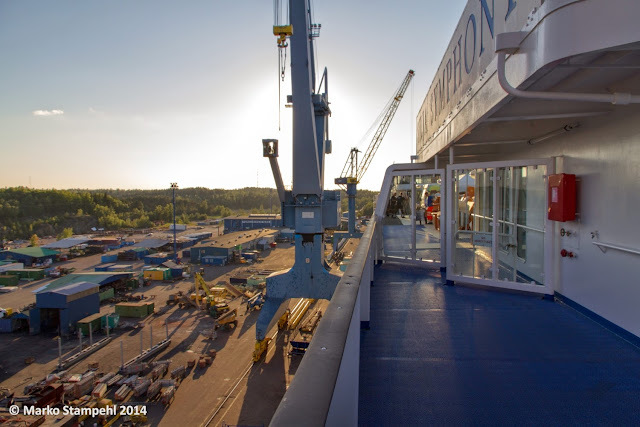 View from Deck 13 (New York Club and Lounge) on the shipyard area with its massive cranes. 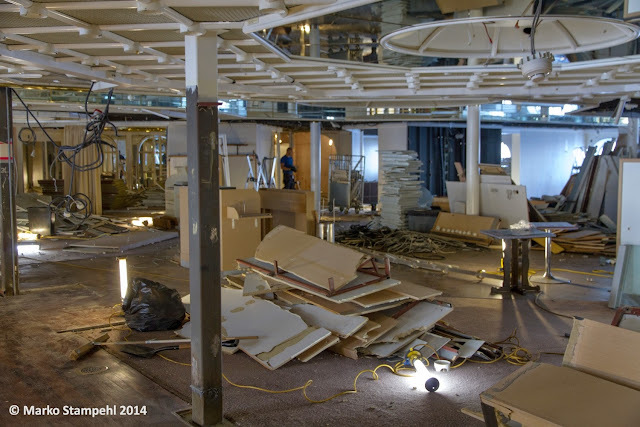 Dismantling the old pirate ship of the old Siljaland. 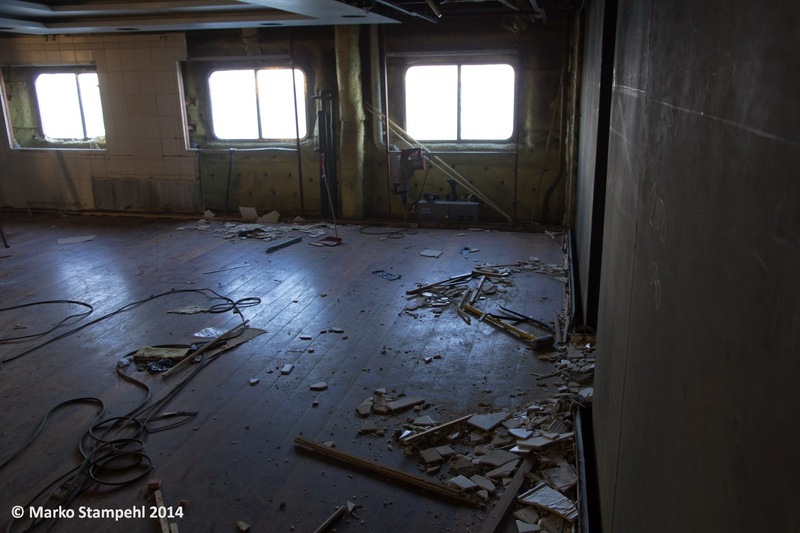 from being affected by the works. 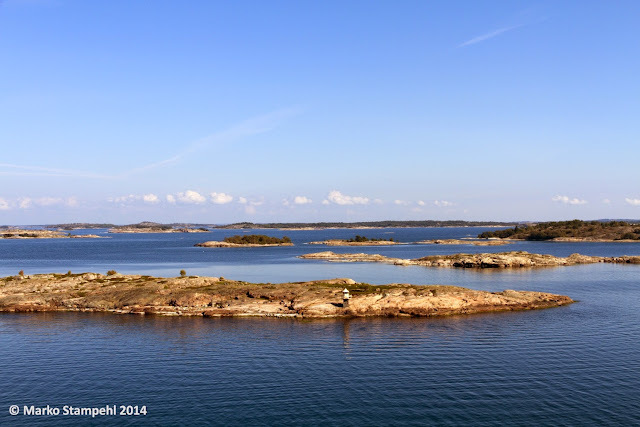 Final views of SILJA SYMPHONY before we went back to Helsinki.